A: 15 x 9 cm; 1 envelope; paper; white, black writing; B: 23 x 15 cm; 1 letter; paper; tan, black writing. The envelope (A) is addressed to “Mr. Long-Pal.”; the letter (B) is a receipt from the Nationalist Party to Hwang Long-Pal, regarding his total payment in 1929. Dated: June 17, 1929; Photographed: 982.020.032 A (Letter); (Translated by: Sen-Shou Lin June, 4th, 1988). This was a notification to Mr.Hwang Yo-Pal informing him of his overdue fees to the Cumberland Chinese Nationalist League. Mr. Yo-Pal (Mr. Youpei) owed the League his membership fee of six months from January to June, which added up to 3 dollars, plus a tax of 6 months totaling 1.2 dollar to the headquarters. Besides, he owed the Cumberland branch an annual donation of 1 dollar. In total, he owed 5.2 dollars. 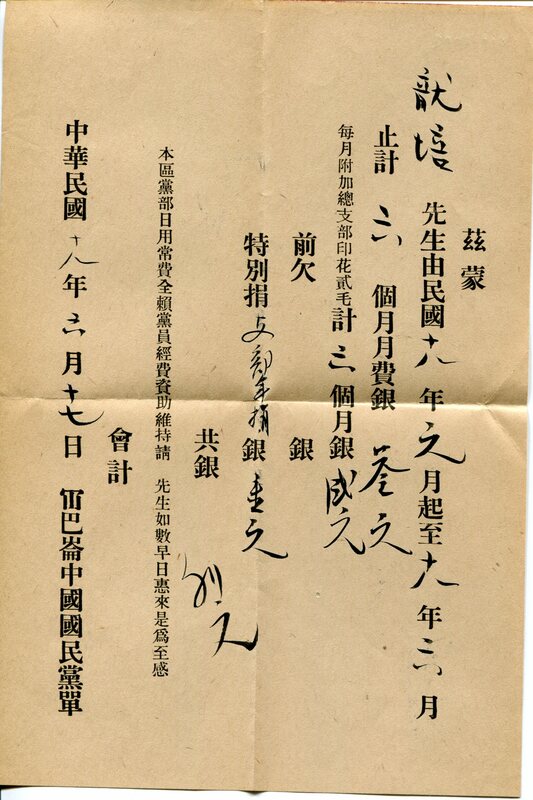 The notification was dated June 17th in the 18th year of the Republic of China (1929).